It's Chelsea: Want a glowing complexion? For me, taking care of my skin is a priority. I love reading about other people's skincare regimes, so I'm going to share mine. It's nothing fancy but I have finally found a good set of products (after a long period of trial and testing!) that I am 100% happy with. I don't know about you but the best feeling after a long day is wiping all that makeup off your face! 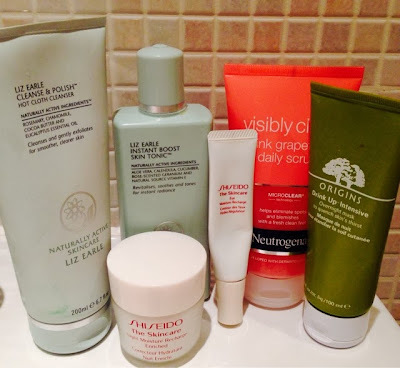 For this, I use the cult beauty product Liz Earle cleanse & polish with a muslin cloth to take off the majority of my makeup, including eye makeup. It's a really gentle, creamy texture makes the process really quick and easy. I then squirt another small pea size of it and smooth it all over my face and use a cotton pad to remove the remainder of my makeup to make sure it's squeaky clean! I usually use this in place of the Liz Earle cleanse & polish in the morning to wake my face up a bit (especially at 6:30am when I'm getting ready to go to work...) and for around £5, you really can't go wrong. This is a really gentle scrub that says you can use daily, however I tend to use it every other day. Definitely don't use it if you have any breakouts as it will only spread the germs! I then pat on some toner with my hands which really refreshes my face, whilst getting the blood flow going. This has a really nice spa like scent to it which relaxes me! I have used shiseido day and night creams for as long as I can remember and it has really done the job. It keeps my face super hydrated during the night and if I try and use different face creams, I tend to wake up with dry patches on certain areas of my face, like my nose and some blemishes. And as you can imagine, it's not very attractive.... And it is only enhanced when you put foundation on! So yes, I will be sticking to this night cream until I can find one that does a better job. This eye cream has seriously lasted me over a year now and I'm still not even close to finishing it! It is quite pricey, as all eye creams tend to be but if you can get use out of it for over a year for around £40 then I think it's definitely worth the price tag. I squeeze the tiniest amount on each of my ring fingers and then lightly pat it underneath my eyes and take the remainder of it onto my eyelids. This eye cream is mainly for hydration purposes (I don't need anti ageing eye creams...yet!) and it's the best eye cream I've come across so far. 3) Wake up the next morning with a glowing complexion? Check! I use this about 2 or 3 times a week depending on what I'm doing I'm doing the next day and whether or not I need extra nice skin! I'm near the end of the tube but I will definitely be repurchasing it. All I do is apply a small pea size of it after I've applied moisturiser to really seal in the moisture over night. For those of you who have very oily skin might want to skip the moisturiser and apply this face mask instead to avoid an extra shiny face the next morning! Hope you enjoyed reading about my skincare regime. I would love to hear about yours!